After a request for a schematic in another thread (https://www.diystompboxes.com/smfforum/index.php?topic=121377) I've been reading the schematics and doing a bit of analysis of the thing. I'll post the results on my website when I'm happy with it, like I did with my Boss MT-2 Metalzone analysis. Seems like I find these weird 1980's metal pedals most interesting to look at - they're certainly not your standard overdrive. Now, the thing that grabs my attention as most interesting straight away is the way that gain pot is wired so that there's a change in the first transistor stage Q3/2N5088 at the same time as a reciprocal change in the op-amp gain stage U11A. I was expecting to see some tonal changes in the first stage Q3/5088 when the pot is altered, but in the simulation, I don't see anything. The pot seems only to change gain, which is a bit dull and could have been done more simply. So what am I missing? There's some interesting features in this circuit though - asymmetric clipping around the op-amp, followed by a pair germanium diodes that I think act as a noise gate by not conducting until a certain threshold voltage is reached, followed by clipping diodes to ground. So my question is: what's going on with those first two transistor stages, and why the odd arrangement of gain pot? Doesn't it work as a LPF for the signal comic from Q3? Sorry, I'm not understanding you. Does what work as a LPF for the signal from Q3? The string down to ground R6/C10/P6? Or the stage around Q7/2N3906? I was expecting some tonal changes on the signal from Q3 from the changing resistance of P6, but I haven't managed to model it with the simulation yet. I get a lowpass response, but it doesn't change when you tweak P6. Probably my error. For what i see, the role of Q3 is just to control gain. The upper transistor is a booster, and the opamp is working as a non inverting stage. That R18/R19 biasing network is a little odd. Should I assume it is being used to produce a bias voltage well ahead of the BBD used to produce the delay? And DOD/Digitech regularly used gyrators in their designs to produce resonant bumps ahead of clipping stages. That's not one of them, is it? Indeed, that bias is very confusing. This stage is followed by the delay, but that R18/R19 bias network is separated from it by two different 1u caps (C13 and C14) so I don't think that is it. I wondered if it might be to correct a DC offset caused by the assymmetric clipping. It's also connected directly to the PNP's collector. What effect does it have there? R18 is the one that confuses me. Otherwise the Q7 PNP stage is exactly the same as the Q3 NPN stage except upside down. R19 is 10K like R9, 470K and 120p to the base in both cases, 100K from there down (or up). Only difference is R13 is 10R and R16 is 100R, but that doesn't seem like a huge deal. What's the purpose of having one NPN stage and then one PNP, do you think? Why would you do that? PS: This is the full schematic if you feel the need to have a look at the whole thing and see how this section fits in. Signal polarity. Invert, then invert again. R19 is the collector load for the PNP, as is R18, but the combination makes the bias to the op amp vary from 4.5v. I suspect this has something to do with the different clipping points of the diode combinations on the op amp. Yes, it's a somewhat complex clipping scheme. First two stages do not actually contribute anything significant - below about 40mVpp input signals. This seems like somewhat low figure but to put it to context, the input sensitivity of this circuit is so high that the shunt clipping diodes in the ouput will clip already with 4mVpp input signals and those asymmetric "soft" clipping diodes in feedback loop a bit earlier, with 2mVpp input. So basically the second gain stage starts to asymmetrically compress the signal somewhat before the shunt clipping diodes begin to "harder" clip it symmetrically. Yes, germanium diodes are a "coring" noise gate. So, contribution of first two stages to distortion is negligible. They do introduce slight amount of bandwidth reduction before distortion but compared to "modern" distortion designs the reduction is actually quite modest. Also the gain control scheme is designed to operate at pretty much full effective bandwidth of the guitar. Control's interaction with frequency response is therefore minimal and likely inaudible. That's the way the effect was designed. You can change it by altering the coupling capacitances, as usual. I believe the purpose of the "dual gain control" is to achieve somewhat logarithmic tapering function while using linear taper because gain (or attenuation) in total becomes multiplied. The bias network is not the ordinary resistive divider to "haf supply". If you look at it, R19 is basically a collector load for a feedback bias amplifier that automatically biases its collector output pretty close to half supply voltage. I think R18 is a "fine-tuning" addition to make sure that collector voltage actually remains around 4.5 volts. Somekind of "pull-up" resistor perhaps? R19 is the collector load for the PNP, as is R18, but the combination makes the bias to the op amp vary from 4.5v. A quick look at the circuit in MultiSim reveals that the 62k (R18) doesn't do much. It reduces gain by around 1 db and changes the bias by little more than 0.1v. I suspect that the circuit would sound very much the same with or without R18. Teemuk is dead right about the Boss HM-2. They're virtually identical. Compare and contrast! Sorry Jack, I don't understand this. The first Q3 stage is inverting, so why can't you just repeat another stage with an NPN to re-invert the signal. Why does it need a PNP instead? The first Q3 stage is inverting, so why can't you just repeat another stage with an NPN to re-invert the signal. Why does it need a PNP instead? That is certainly the question. Two NPN stages should have worked just as well to restore the polarity to non-inverted. I suspect that Korg was just copying Boss, but I haven't a clue why Boss did it that way. They did have a tendency in older designs to want to use NPN followed by PNP stages, which can be seen in some of the digital delays where a 2-pole NPN transistor filter is followed by a similar PNP transistor lowpass (RDD-10 for example). > A quick look at the circuit in MultiSim reveals that the 62k (R18) doesn't do much. Did you put a real opamp after it? Without the 68K the opamp pin is slammed to its V-. Some opamps make nasty noises when you do that. That's actually sensible. Direct-coupled emitter followers, all same parity, you lose 0.6V each stage. 4.5V bias at the first comes out 2.7V bias at the third stage. Flip polarity in each stage, you can go on forever. Still, it's a bit odd here, since they only use two stages (so the drop in bias level wouldn't have been a big deal) and then they mess with the bias with that 68K resistor anyway. It'd have maybe made more sense in the Delay filter part of the circuit, where they've got several filter stages in a row. I've put the analysis online now too. Any comments or corrections are appreciated. I think it's become a bit long, so I'll probably keep working on it to try and make it a bit more concise. It's easy to write too much, and much harder to say the same thing in less words. But it makes for much better reading if you can! I used the LM833, only because it was the first bipolar opamp model I saw when I was adding it to the sim. For the direct-coupled emitter follower that's true... probably not the best example since the gain stages in the HM2/PDS1550 distortions are AC-coupled. Compare the DOD FX56 distortion circuit from about the same time, probably also copied from the HM-2. That DOD FX56 schematic is exactly the same as the PDS-1550, which probably is to be expected. They bundled the Metal distortion channel up into a pedal in its own right, or perhaps they used the existing FX56 design for the Metal Distortion channel when they wanted a design for the PDS-1550. One or the other. What I find interesting is that no-one seems to be aware that these pedals are direct HM-2 copies. The Boos HM-2 is getting more and more expensive and in certain circles is one of those "legendary" pedals. And yet there are lots of cheaper vintage pedals with basically the same circuit, even down to the hopeless errors which I wouldn't have expected from Boss. A nice little detail of that design is that tone control's filters mimic the archetypal frequency response of a tube amp driving a reactive loudspeaker load: One peak in response at typical resonant frequency range, second peak to imitate treble boost due to rising coil impedance at higher frequencies. Metal Zone has a similar feature as well. I'm reading the article, i love your analysis ! 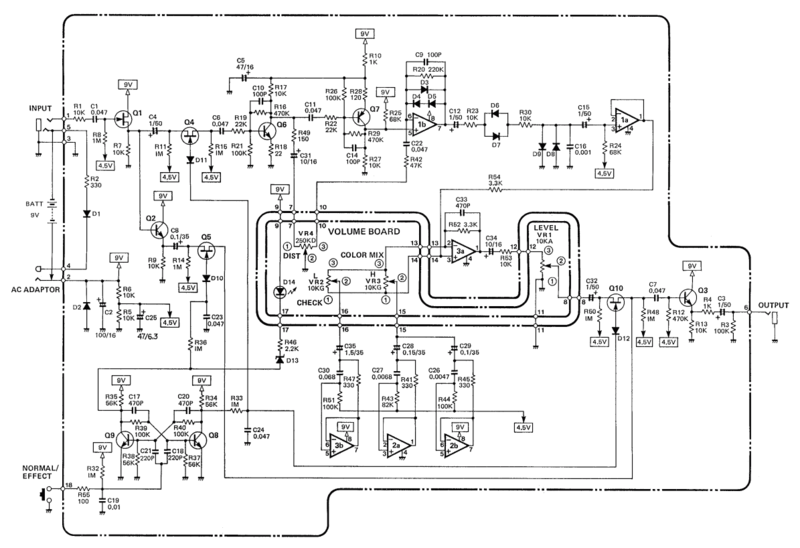 Just point out that the opamp stage is non inverting, though.